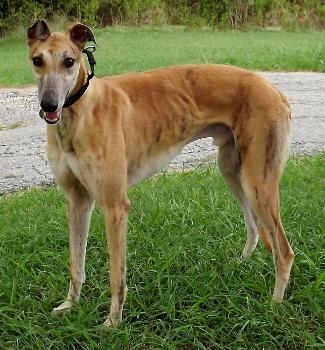 History: Gatsby is a gorgeous red "accidental" brindle (red with very few black markings). He is tall and lean with a slick, flat coat. His ears fold forward (turn signal ears). When you hear that a dog is "just off the track," that would be Gatsby. 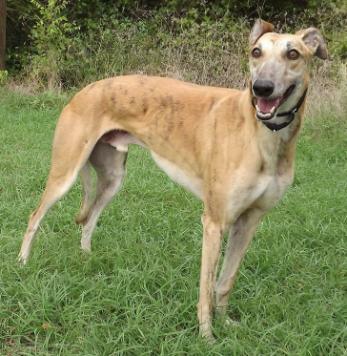 His last race was on August 7, 2012, at Ebro, Florida. It is obvious he has not been in a home situation in close proximity to other dogs. He has had a busy first day and is still a little wound up. After running off a little energy in the back yard and eating his dinner, he began to relax. He will learn that living in a home is a more relaxing environment than a racing environment. 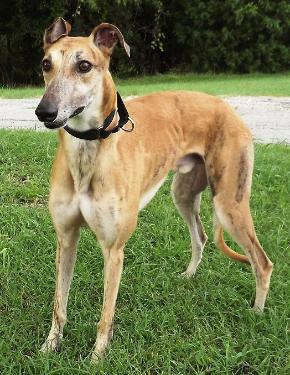 Gatsby went to Flint, Texas, to live with the McGee family, including former TAGS girl, Pippi. 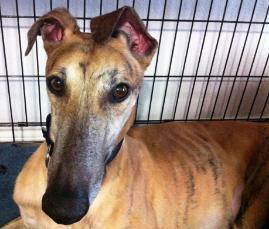 September 15, 2012 update: Gatsby was adopted to his lifetime home and now has a Greyhound sister, TAGS dog Pippi. Congrats to all! August 29, 2012 update: Gatsby has been in his new foster home for only several days and he is still curious about EVERYTHING. Every day is a new adventure to him. He seems to get joy from everything. He has taken to one of the female Greyhounds in the household and she is very smitten with him. Their playing together is very cute. Gatsby has only met the cats one time, but he has heard and smelled them a lot. One time he heard a cat meowing on the other side of a closed door. He was so funny! He stood very still for about 3 minutes solid! This morning I had the baby gate up while I fed the cats. Gatsby stood at the gate and watched but didn’t whine or do anything. He is still curious but we are letting him get used to this home environment and being around the cats before we introduce them again. Gatsby lllooovvveeeesss toys!! That didn’t take long!! (He’s only been in a home for 10 days.) He is very lovey-dovey. Such a sweet boy. 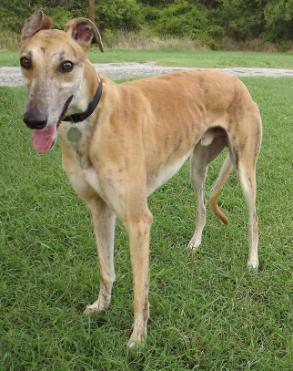 August 20, 2012 update: Gatsby will be starting a new life of retirement by coming to TAGS to find his lifetime home.